Are you looking for home-based food business ideas? Here is another easy recipe for you: how to make lumpiang shanghai. 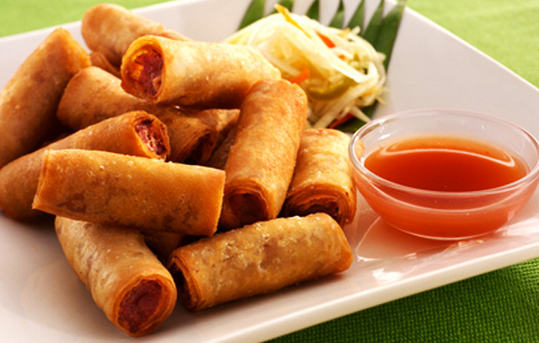 <>Lumpiang shanghai is another popular variation of spring rolls. What makes it different is that its main ingredient is ground pork or beef, combined with minced onion, carrots, and a number of spices. As the name implies, it is another Chinese dish. Some historians think that it was brought to the country by immigrants from China’s Fujian province hundreds of years ago. Through the centuries, lumpiang shanghai has become a staple menu in Filipino households’ feasts and celebrations. It is commonly served during birthday parties, family gatherings, Noche Buena, and Media Noche. You may agree that eating lumpiang shanghai can be nostalgic. That is because one can easily associate it with family gatherings and special occasions in the past. Most Filipino celebrations and feasts may not be complete without lumpiang shanghai served in the table. Not surprisingly, many restaurants and catering businesses also make it a part of their special menu. Some enterprising home-makers and home-based food entrepreneurs accept orders for lumpiang shanghai. When served, lumpiang shanghai goes best with sweet and sour sauce, which fortunately is widely available commercially through groceries and supermarkets these days. However, some foodies prefer banana ketchup as dip. Here is a simple recipe that you may use if you intend to try out putting up a small food business out of cooking and selling lumpiang shanghai. Take note that you may use egg white or beaten egg as paste that will firmly hold lumpia wrapper in place before and after cooking. 1. Combine ground pork and all ingredients. Put two eggs to provide sufficient moisture. Mix thoroughly until desired consistency is achieved. 2. Wrap 2 tablespoons of the lumpia mixture in a piece of lumpia wrapper. Seal it using egg white or beaten egg. Continue to do so with the rest of lumpia mixture in the bowl. 3. Deep fry each lumpia in a pan filled with cooking oil for 10 minutes or until lumpia turns golden brown. 4. Remove lumpia from the fryer and set aside to allow cooking oil to drip. 5. Put into a serving plate and serve with sweet and sour sauce. Wrapped lumpiang shanghai is sometimes sold uncooked and ready to be stored in the freezer for several days or weeks. Some consumers prefer to keep it frozen until a special occasion comes. This way, lumpiang shanghai can instantly be enjoyed after deep frying.